Concrete is made of aggregates — particularly sand and gravel — bonded together permanently with powdered cement, water and a bit of air to make a durable, compact, fire-resistant and watertight building material requiring little or no maintenance. The Egyptians first put calcinated gypsum — the forerunner of concrete — on stone or brick to create a smooth coating. Ancient Greeks similarly utilized calcinated limestone, while the Romans made the first concrete out of broken bricks, mixed lime putty and brick dust or volcanic ash. 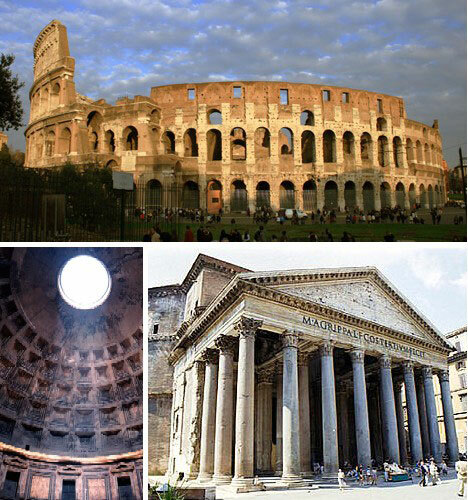 They used it with stone to construct roadways, buildings and even the Appian Way aqueduct system which remains today. After that, little concrete was used until advances furthering the development of cement occurred in England. In 1756, John Smeaton discovered that burned and slaked limestone hardened in the air and under water. Forty years later, James Parker improved cement by grinding it into a powder. In 1824, Joseph Aspdin patented a calcinated limestone and clay powder mixture and named it portland cement because, when made into concrete, it resembled stone from the isle of Portland. In 1902, August Perret designed and built a Paris apartment building using reinforced concrete. In 1905, Frank Lloyd Wright began building the Unity Temple in Oak Park, IL, with four identical sides, so his formwork could be used multiple times. In 1908, Thomas Alva Edison built 11 cast-in-place concrete homes in Union, New Jersey, that are still in use, and laid the first mile of concrete road. Early truck mixers could each carry only one cubic yard of concrete apiece, although over the years capacity gradually increased to three yards per truck. (Compare this to 10 to 12 yards per truck today.) Revolving drum agitator units were introduced for truck mixers. In Seattle, the first horizontal drum truck mixer — the Paris Transit Mixer — debuted in 1927, and became popular across the country. 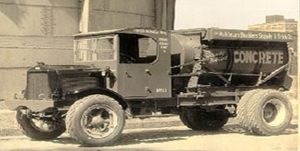 In 1928, Kuhlman Corporation purchased its first mixer trucks—two Barrymore concrete mixers mounted on White truck chassis. The cost was $8,391 per unit. In 1930, horizontal-axis revolving-drum mixer trucks — similar to today’s concrete mixers — were introduced by three American manufacturers. Despite the Depression, the ready-mix concrete industry took off and the National Ready Mixed Concrete Association was formed that year. By 1941, more than 700 ready-mix plants were in operation in 442 U.S. communities. Ten years later, there were an estimated 1,700 ready mix plants in over 1,300 towns and cities. Rapid developments have continued. 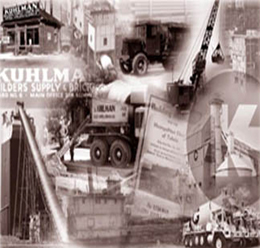 Today, Kuhlman Corporation and other major concrete producers make a science out of developing just the right concrete for a particular job. They have concrete laboratories, certified quality assurance specialists, a wide range of admixtures to chose from depending upon the job’s requirements, plus the latest in computerized batching and dispatching equipment.